With Easter coming soon, it’s time to prepare ourselves for one very popular tradition – painting and decorating Easter eggs. This is the time of the year where every craft store is full of so many Easter – inspired decorations, so why not use them well? It’s very hard to pick just ten decorating ideas when there is a whole sea full of them, but we managed to find out favorites and in this article we are now sharing them with you. They all are seriously simple and budget – friendly. It’s all up to you to just get creative! Working with tissue paper leaves you with many possibilities. You can pick one-colored or colorful paper, it all depends on your taste and a reason plus to try this out because it is a cheap way to get amazing looking Easter eggs. Besides the tissue paper, for this project you need plastic eggs, Mod Podge and scissors. 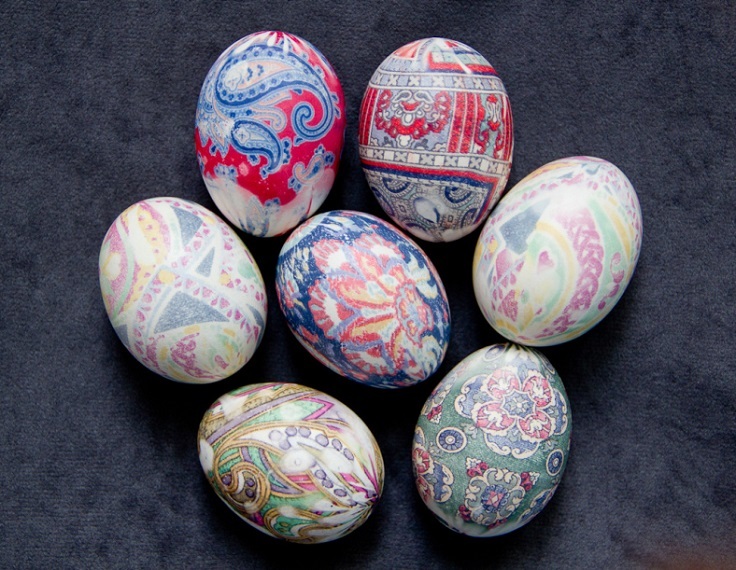 Using silk to decorate your Easter eggs will make them very unique and beautiful. 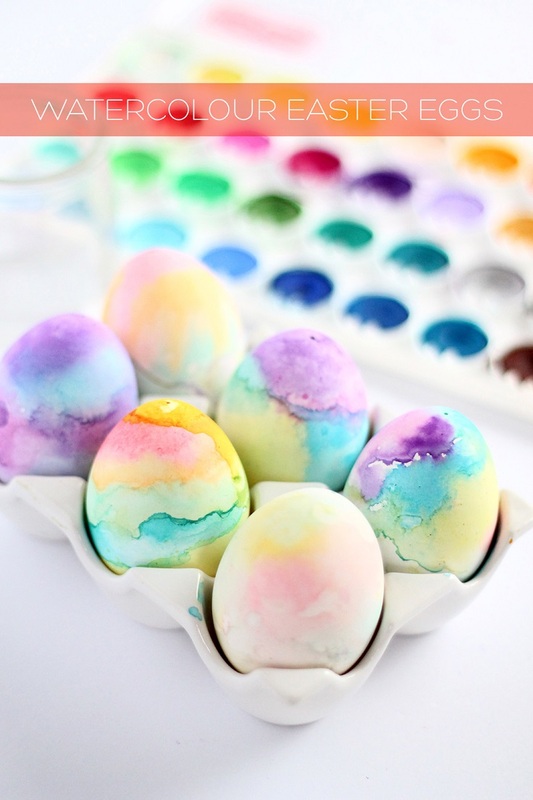 But, in order to look like that and for you to have successfully decorated the eggs, you must use 100% silk. When it comes to the eggs, picking a medium – sized raw eggs might be the best because of their size. You will also need fabric scissors, white cloth, a pot, twist ties and/or rubber bands, vinegar 1/4 cup, tongs, vegetable oil and paper towels. 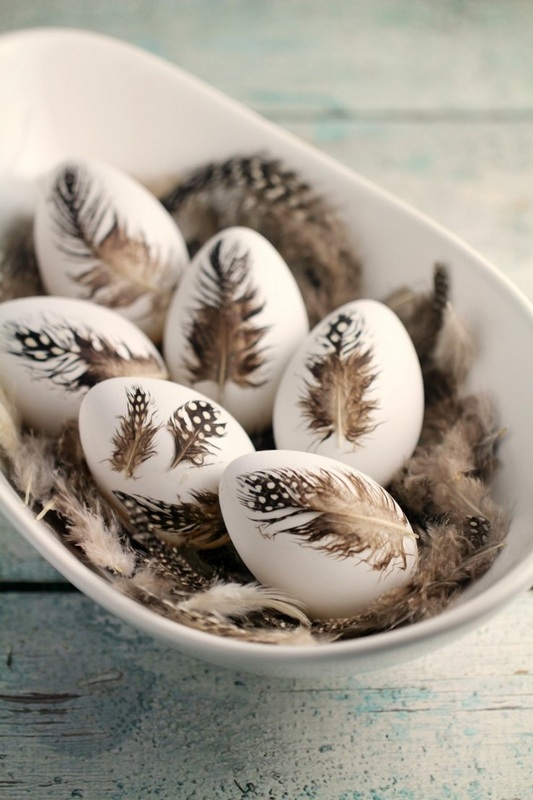 Feathers are a popular choice when it comes to decorating Easter eggs. It’s the kind of decoration that really won’t empty your pocket, as all you need are just store – bought feathers for decorations, Mod Podge and foam brush. It’s a really simple project – lay down a feather on each egg and brush it off with Mod Podge to secure it. When it’s dry, you can apply another coat of Mod Podge. 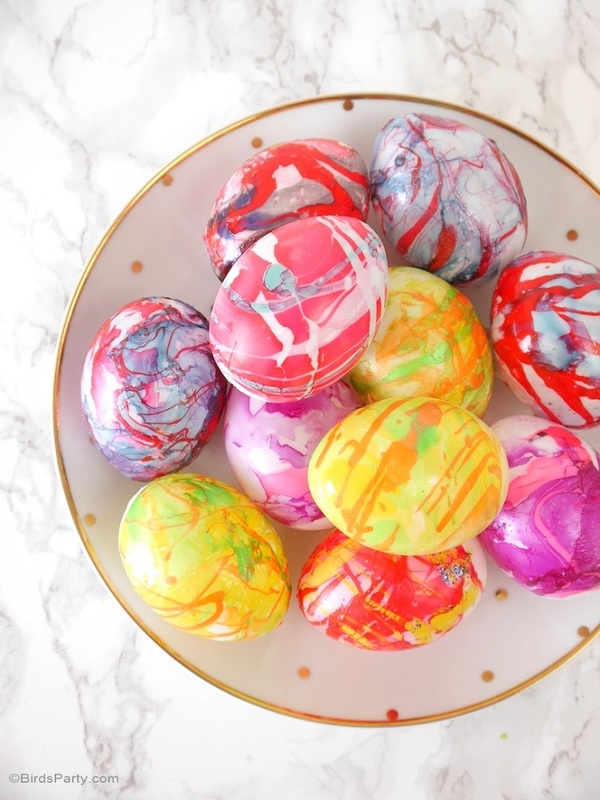 Another easy and super way to decorate your Easter eggs is by using nail polish to create the marble look. FOr the project, you will need white plastic eggs, nail polish in any color or texture, old plastic bowl filled with water, wooden skewers and styrofoam block for the drying time. Choosing plastic over real eggs means that in case you’re not satisfied with the outcome, you can just wipe it off and start from the beginning! It can’t get any easier or cheaper than this – just get yourself colored permanent markers, paint and brushes and get creative! As you can see, painting doughnuts can be fun and make your eggs look unique! 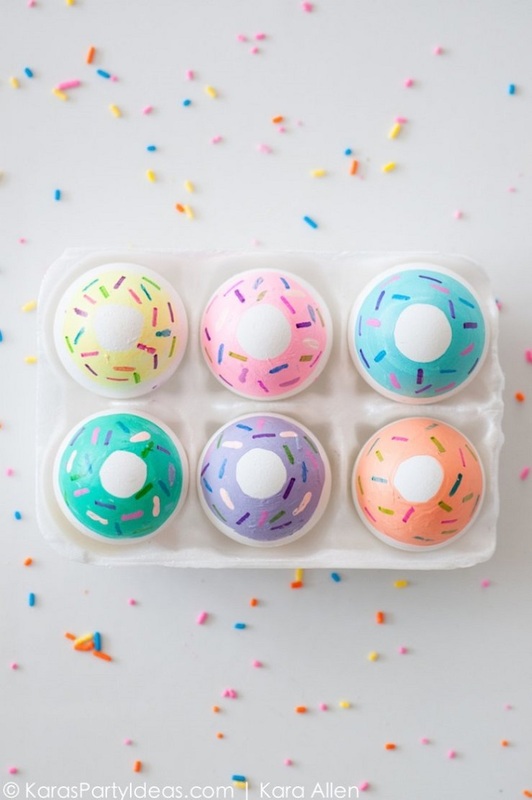 First you paint the eggs in order to create the doughnut shape and once it is dry, use the markers to create the sprinkles. That’s just it! This is ideal if you want to test out your art skills. You just need watercolors and a brush – the rest is up to you. There is a lot to experiment with, you can use more or less water, one or more colors and create different effects. Another good reason on using watercolors, besides being fun, cheap and creative, is that you can create together with your children and have some fun. Be sure that with Easter eggs like this, they will catch the attention of every guest in your home. Everyone will be fascinated by how adorable these eggs look! 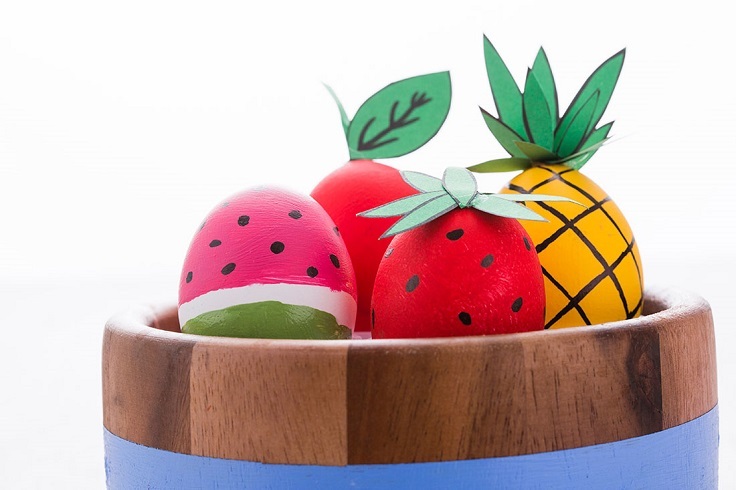 To make your own fruit – inspired Easter eggs, you need blown eggs, paint in various colors, green cardstock, green tissue paper, black sharpie, paint brush, hot glue and scissors. Pick your favorite fruit and use these materials to create Easter eggs! 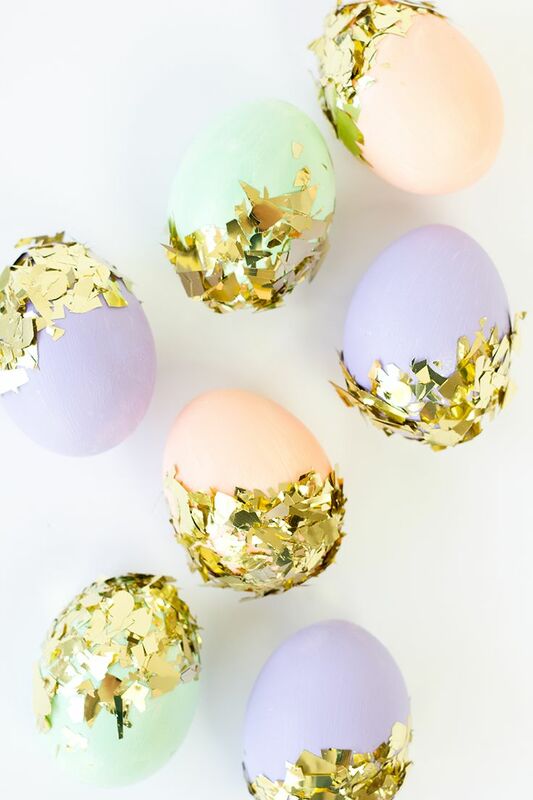 If you’re a fan of confetti, then we’re glad to show you these amazing Easter eggs dipped in gold confetti. 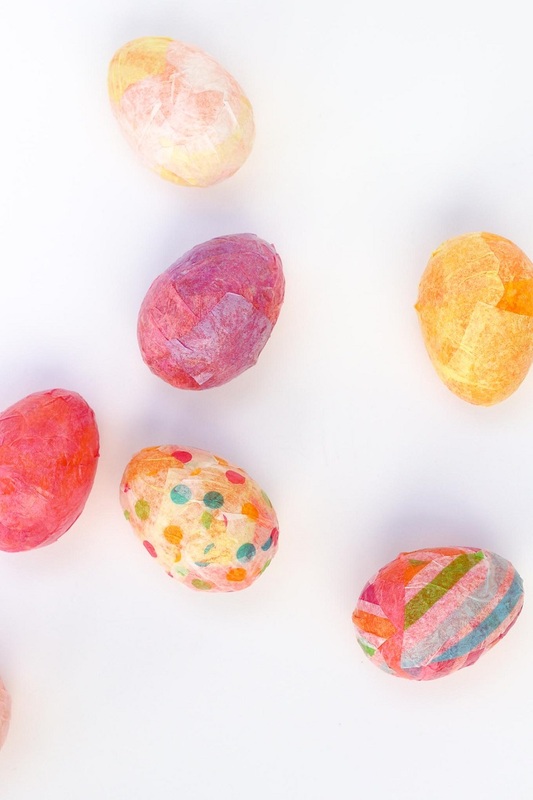 First paint your eggs with craft paint and when they’re dry, apply a thin coat of Mod Podge to the place where you want the confetti to be and sprinkle some! Let them dry on a drying rack and that’s just it! 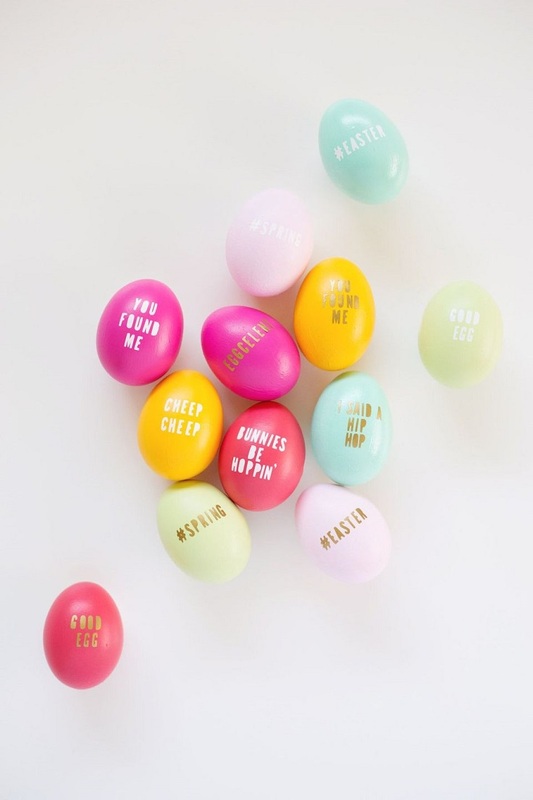 Aren’t these Easter eggs so adorable? You will even love them more when you’ll find out how cheap and easy this decoration is – you just need a green egg dye and a black marker. 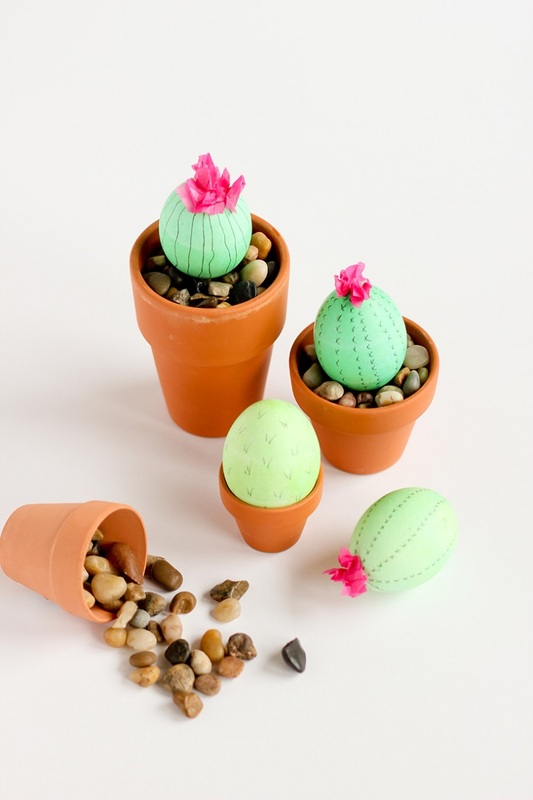 Follow the instructions for the green dye and when it’s dry, just draw the black lines to make it look like a real mini cactus. You can glue a pink tissue paper flowers on the eggs as well! , scissors and craft knife, Cricut cutting machine (this is optional, but recommended because it makes the whole process easier), craft paint, paintbrushes and tweezers for the placement of the letters on the eggs.